Stada is a German generics company with horrible corporate governance and an activist investor (“AOC”) who wants to change the board. In many 100% free float companies, management and supervisory board don’t act as stewards of the shareholders money, but make decisions that only serve themselves. This is why I typically avoid investing in them. Stada is the epitome of a poorly run 100% freefloat company. The Former Manager Mr. Retzlaff, who built up the company, turned it into a vehicle to enrich him and his friends. He made millions in bonuses in years Stada didn’t perform; Retzlaff’s pension promises were in the tens of millions – among the highest in corporate Germany; his son entered the company straight out of university, was promoted to the board, earned millions and held responsibilities he shouldn’t have had within only 4 years working for the company. The list goes on an on. Last Friday was the company’s AGM. The media coverage around the AGM was huge as everybody expected the final showdown between the current supervisory board and AOC. In my speech I criticized the corporate governance and urged shareholders to vote against the current board. It seems very obvious that Stada will create more value for shareholders if AOC takes full control, than it would if the previous system of poor corporate governance stays in place. Thus, shareholders were in a sense voting directly for the performance of the Stada stock over the next years. That lead me to make the masochist quote. Unfortunately too many. Shareholders voted for 6 members of the board (all shareholder representatives, but not the employee representatives). The only big success was the dismissal of Dr. Abend (dismissing a chairman rarely happens in a German company and feels like a victory for good corporate governance). Mr. Oetker stayed on the board. The main reason is that many funds (even AOC supporters) did not want to exchange the entire board as they wanted some continuity. AOC lost with their two other candidates. This was in large part due to a technicality (proxy voters were not able to vote for AOCs candidates because of the way the vote was designed). So Dr. Abend is out, but AOC was only able to take one place on the board. So what do we make of these mixed results, where AOC gained more control, but not full control? I assume one of the following will happen: Either AOC and its supporters will gain more control over time and lead the company into a long term restructuring / buildup. AOC talked about 1bn in EBITDA as a 5 year target – this would likely result in a tripling of the stock. I am a bit skeptical about this targets but do agree that there is a lot of potential in the company. Another option is a takeover offer. I believe there are many interested buyers for Stada and hope the new board will allow a due diligence. In this case I think the upside is 20 to 30% within the next year. I prefer the latter to happen, but am fine with both results and keep my long position in the stock. 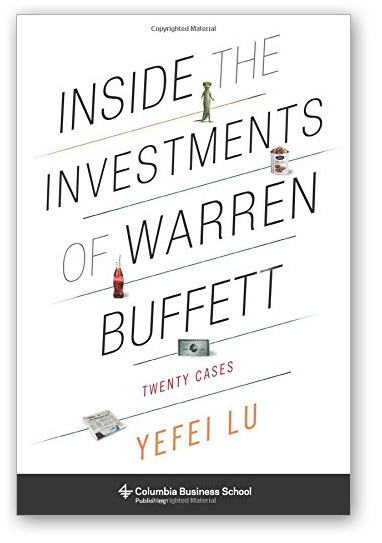 My friend and former workmate Yefei Lu just released a book called “Inside the Investments of Warren Buffett – Twenty Cases“. It was published by Columbia Business School and is available in bookstores now. The book takes 20 of Buffett’s most significant investments and analyses them from the perspective of an analyst, looking at the information available back at the time Buffett invested. While most books about Buffett are rather shallow and written for retail investors, this book goes deeper and offers some true value added. It took Yefei considerable time and effort to dig up all the letters, Moody’s manuals and Annual reports from 40+ years ago. I just started the book, but can already say it is a valuable addition for every serious investor who is interested in Buffett. On Amazon, you can have a quite extensive look into the book before purchasing it. Trump is openly lying. He displays his ignorance with pride and shows again and again that he basically knows nothing about the world. Yet the more he contradicts himself and the more absurd it gets, the more he is celebrated by his supporters. The United States is a country of 320m people. It has some of the greatest universities in the world and no shortage of brilliant scientists, business men, thinkers, philosophers and philanthropists. Besides all of this, the best two candidates to run the entire country are apparently Hillary Clinton and Donald Trump. Let that sink in for a second: 320 mio people and the best they can come up with are those two. Why is it that a somewhat dishonest, populistic person and a complete lunatic who you can’t trust with anything he says were selected to run for president? The sad truth is that the average voter simply does not value intellectual honesty and integrity very highly. People simply digest what mainstream media serves them, and mainstream media is not interested in intelligent disagreements and nuanced points. What sells are black or white thinking, shallow populism and scandals. I aggree with Ray Dalio that society’s inability to have an honest, thoughtful disaggreement is one of the biggest problems in the world, and it somehow seems to get worse. For the fourth year in a row I visited Omaha Nebraska to attend Buffett’s shareholder meeting. When the meeting started, a deep voice welcomed the crowd to a “gloriously capitalistic weekend” – and indeed it was. But Omaha is more than just the woodstock of capitalism. It is a place where you can exchange ideas about investing, life and the world with hundrets of thougthful people. You can meet with fantastic small money managers, but also with big names who run tens of billions, such as Tom Russo, Mario Gabelli or Bill Ackman. Those guys are often surprisingly down to earth and open for a talk at the bar. Even a random encounter with Buffett, Munger or Bill Gates happens from time to time. If you are interested in investing, I can only encourage you to visit the Berkshire AGM at least once in your lifetime (or Buffett and Munger’s lifetime). I feel many people reach their peak intellectual capacity somewhen in their twenties, when they study or start out in their professions. Once they are settled in their career and know “how things work” they seem to be grateful that the painful brain work is finally over and happily go down a path of deteriorating brain power and mental flexibility. To me this is a horrifying outlook. For this reason my personal highlight was seeing Buffett (85 years old) and Munger (92 years old) once again defying the seemingly immutable “law of brain deterioration”. The clarity and depth of Buffett’s thoughts, the breadth of Munger’s wisdom (I hightly recommend his Almanac), and the humor they present it with , is incredible. This shows that a brain that is constantly challenged can stay remarkably fit well into its 90s – an outlook I find way more appealing than the one mentioned above. Munger made a comment about how seeing only one side of an argument is “immature and stupid”. This touches the topic of confirmation bias, which I feel is one of the most prevalent among people in general as well as among the value investing community. We seem to have a very strong tendency to interpret data in a way that fits our world view. The list goes from investors “reading” investment books but only underlining the parts that confirm their beliefs, to atheists who can retell every speech of Dawkins or Hitchens about the evils of religion – without acknowledging any positive effects religion may provide but also religious people who rather cover their ears instead of allowing an open discussion about the basis of their beliefs, to vegan doctors who wrote books about nutrition, citing several hundred studies supporting a vegan diet, but don’t even mention the existence of studies indicating something else [No offense, Dr. Greger, I still think your book and website are some of the best sources of scientifically backed information on nutrition. For everyone interested: nutritionfacts.org] etc. Everybody loves to have a strong opinion, but nobody wants to put in the work to understand the other side of the argument. The really great thinkers (Munger, Darwin…) seem to actively seek evidence that goes against their beliefs. This is true on a broader level discussed above, but also on an investment level (try making a short case for every investment in your own long portfolio). Only if you know your opponents arguments better than him or her, you really mastered a topic. Whether it is electric cars, solar power, e-commerce, an increased accessability to supply chains in Asia or artificial intelligence (which, as we know from Elon Musk, may eventually kill everything). I think these are legitimate concerns that investors have to take seriously. Innovation happens exponentially and the world is indeed moving faster and faster. So how to invest in a world that seems to provide less and less certainty? A solution for investors looking for long term compounders may be to not avoid technology altogether but to seek companies that manage innovation well. I got this thought from a befriended investor who has a great track record. As an example he mentioned the seemingly stable business of parking lots – which may still get disrupted by self-driving cars / car sharing and on the other side Google, which seems to have a culture that helps the company to stay ahead of the curve. Another option would be to move towards an investment style that doesn’t require very long term projections about the future (e.g. “deep value” or restructuring plays, that usually play out over a 3 year horizon).Even though I prefer hunting for great businesses and meeting great managers, I’m also happy to invest in the occasional restructuring play. On a sidenote my current favourite stock in the latter category is Stada, a German generics company that was undermanaged for decades. Change was impossible as Stada’s shares have restricted transferability which allows management to reject any strong shareholders who want to take control of Stada. Now Active Ownership Capital, an activist fund from Frankfurt took on the case and is already making progress in changing the board. I know the founders of AOC and think there is a very high chance they will be successful. If they are, the upside will be more than satisfying; with very limited downside – even pre activists, the company was stable, profitable and trading at an undemanding valuation. AOC presents its case here. Buffett stated that Reinsurance will be a worse business in the mid-term. Besides the low interest environment additional competition from hedge-funds that entered the field hurts the business. Glassdoor was mentioned to me several times. It is a website on which employees can rate their employer. I haven’t really used it in my research so far but I think it makes sense to include glassdoor checks in my investment process – especially when researching peoples-business. 3 Day Value Investing Program at Columbia: A friend just signed up to a 3 day value investing program at Columbia University in June (USD 7,000). I’m very curious to see how that goes. To be continued… Part 2 will contain some investment wisdom from Tom Russo, Pat Dorsey and others.